The farm is a great place for children to grow up: animals, plants, projects and chores instill lifelong learning and work ethic. However, too many children are being injured, getting sick, or being killed on the farm, which is why the National Children’s Center for Rural and Agricultural Health and Safety hosted the Child Injury Prevention Workshop. 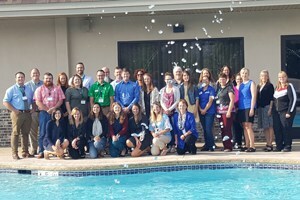 Megan Schossow traveled to Marshfield, Wisconsin to attend workshop which took place August 14 & 15 at Hotel Marshfield and Marshfield Clinic Research Institute. The workshop’s participants ranged from agricultural health and safety centers, Extension, trauma center staff, media, insurance companies, and more. In addition, UMASH was able to connect with center collaborators National Farm Medicine Center and Migrant Clinician Network. Initial sessions of the workshop focused on data and trends in agricultural child injuries and the history of prevention initiatives. Workshop participants engaged with each other and used material from presentations, like Cultivate Safety and Ag Injury News, during the interactive sessions. Participants worked on building skills in program implementation and evaluation, interacting with media, and promotion and dissemination. Scott Heiberger put on his journalist hat to interview participants on real agricultural incidents so that all participants could communicate their agricultural health and safety messages. To put the lessons and skills learned from the workshop into action, several participants attended a grant writing session for workshop project grants. We thank the Children’s Center for hosting this productive workshop!